Dozens of young Catholics marched in Manokwari [2 March 2016] to protest against the repeated interrogations of Father John Djonga by Indonesian authorities. Father Djonga is suspected of treason for having led a prayer service that was allegedly attended by members of a ‘’separatist group’’, despite his claim that his presence was “purely pastoral”. Mr Djonga is a well-known activist for the rights of West Papuans and has reiterated his commitment to continue advocating for them, despite police intimidation. Dozens of young Catholics in West Papua protested in the provincial capital Manokwari March 2, demanding that police stop harassing an activist priest recently questioned for treason. 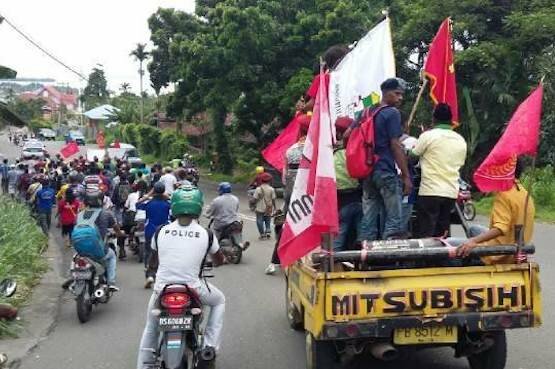 Protesters from the Catholic Youth and the Union of Catholic University Students of the Republic of Indonesia organizations marched several kilometers from the State University of Papua to the offices of the West Papua Police where they held the protest. "Through the West Papua Police, we urge the Papua Police to stop criminalizing Father John Djonga," Thomas Jefferson Baru, head of the Catholic Youth's West Papua chapter, told ucanews.com. Father Djonga was summoned by police in Wamena in Papua province on Feb. 19, four days after leading a prayer service in which members of a separatist group were alleged to have participated. The priest has maintained that his presence at the ceremony to open a community service building was purely pastoral. Father Djonga appeared at the police station in the district's capital on Feb. 26 after consulting with Franciscan Bishop Leo Laba Ladjar of Jayapura. Accompanied by a lawyer, he answered 55 questions from two police officers during the four-hour meeting. Police have said they may call on Father Djonga for further questioning. Baru said protesters are calling on police to leave Father Djonga alone. "Summoning and questioning the priest is a form of criminalization as he was just leading a prayer service," he said. Reimondus Asem, secretary of the student union's Fakfak district chapter, said the police harassment of their priest has caused an emotional upheaval among local Catholics. He believes police questioned Father Djonga because they have little understanding of the priest's role in the community. They should have a better understanding of a priest's service "so there will be no misunderstanding," he said. Papuan police spokesman Patridge Renwarin told ucanews.com that Father Djonga is currently considered a "witness" to a violation of Indonesia's criminal code pertaining to treason. The spokesman said the priest would become a "suspect" should further evidence be uncovered that implicates him. Earlier, Father Djonga, who has long fought for the rights of the Papuan people, said he was told police may call him in for further questioning. He said he remained unfazed by the police scrutiny. "It has been my work in the region with conflicts like this. I have no fear," he said. "There's no way I can just stand still while the Papuan people face injustices and violence."